London Perceived. Text V.S. Pritchett, photos Evelyn Hofer (4/5). Posted: July 28, 2011 | Author: thelondoncolumn | Filed under: London Labour, London Types | Tags: Evelyn Hofer, London Perceived, V.S. Pritchett |Comments Off on London Perceived. Text V.S. Pritchett, photos Evelyn Hofer (4/5). 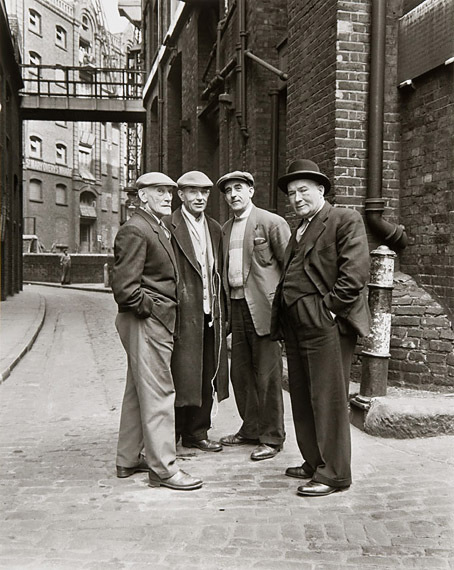 Warehousemen, Southwark, 1962. Photo © Estate of Evelyn Hofer. One goes up-river now enclosed in noise and caught up in work. This is a working river. Hour after hour the radio-telephone is cackling on the tugs. “Calling Sun 17, take the Florian and go in with her. Calling Sun 16, has that little Spaniard moved yet? What’s the matter with her?” Language, old river hands complain, has become politer on the river. Education, they say, is the curse of everything, and the bad-language joke, refined to a high polish of London irony by the characters of W.W. Jacobs (“The langwidge ‘e see fit to use was a’most as much as I could answer”), has lost its anchorage. The Florian is one of the ships lying under the tall sky in the sweep of Gravesend water. It bears down like an hotel upon the tug, and the tug’s cabin boy brings up the eternal mug of strong tea on which working London lives. If you were to go with him to the dock gate, you would see the beauty of the skipper’s job. You would understand why there is all that clever waltzing and pulling this way and that, all that threshing at the stern of the tug as it gently but decisively takes 15,000 tons round a series of sharp right-angle turns into the lock and the alleyways of a dock basin, without touching a quay or any other craft by so much as a graze. These skippers are artists: they bolt down a mutton chop between crise, ruin their digestions, grouse because fog in the estuary has kept them on duty for forty-eith hours without a wink of sleep; but they play their game with the wind, the strong Thames tide, the current and the heavy traffic. The Thames is a main road. It is our Grand Canal, and if you half close your eyes at the Pool, the brown warehouses look like palaces in a smoky Venice. The river men have always quarrelled with the City, and nowadays the quarrel is with the roads, for road transport is killing the coastwise traffic. Some say that in fifty years half the area will revert to what it once was: a pleasure ground, and, heaven knows, the warehousemen and wharfingers of London have up to now killed the waterside as a place of pleasure and amusement. Tug skippers growl when they pass the wharves of the Ford plant at Dagenham, where the iron ore is being grabbed out of lighters, swung high, and sent by conveyors to the furnaces, where it turns into red liquid and where the liquid turns into cars and trucks. “It comes in by water and goes out on wheels”, they say. They hate wheels, for wheels are the enemy of water. But, in London, in England generally, nothing is ever given up if it has a point of law attached to it. The docks were built because the mass of shipping in the Pool became impenetrable; but the lightermen and wharfingers fought for their rights, as hard as Defoe fought for the Dissenters, as the City fought against the King, as Wilkes fought for the press, as the early trade unionists fought. The lighters can be loaded on the water side of the ship, free of dock duties. There is usually money at the bottom of London liberties: there has been nothing abstract in the London view of the desirable life.